When it comes to using online services, one factor seems almost ubiquitous, use of those services is solely at the discretion of the host’s terms and conditions, often without any notice to anyone at any time. Such was the case with the nifty product launched last month, ParaShoot 2.0, a campaign that had met and exceeded its goal in a successful follow-up to a “version 1.0” attempt earlier this year (which did not reach its goal). If you were a backer of the ParaShoot 2.0 campaign, you received an email notice on Friday stating that the campaign had been irreversibly suspended and there would be no comment explaining why to the backers or the creators of the campaign “as a policy.” We will delve into that issue later, as on the face of it, there does not seem to be any apparent conflict with Kickstarter’s guidelines. We have reached out to Kickstarter in the hopes we can provide perspective on the suspension. In the meantime, Matt and Colin are undaunted and have re-launched their campaign, dubbed “ParaShoot 2.1” on Indiegogo. The funding goal is identical to the funds that were raised to-date on Kickstarter, $117,358. They have also added some features to the product to sweeten the deal while keeping the perk prices identical. The larger funding goal will ensure that the newest features are part of the final package. The versatility of ParaShoot 2.1 is pretty neat. Want a dash cam for your car? 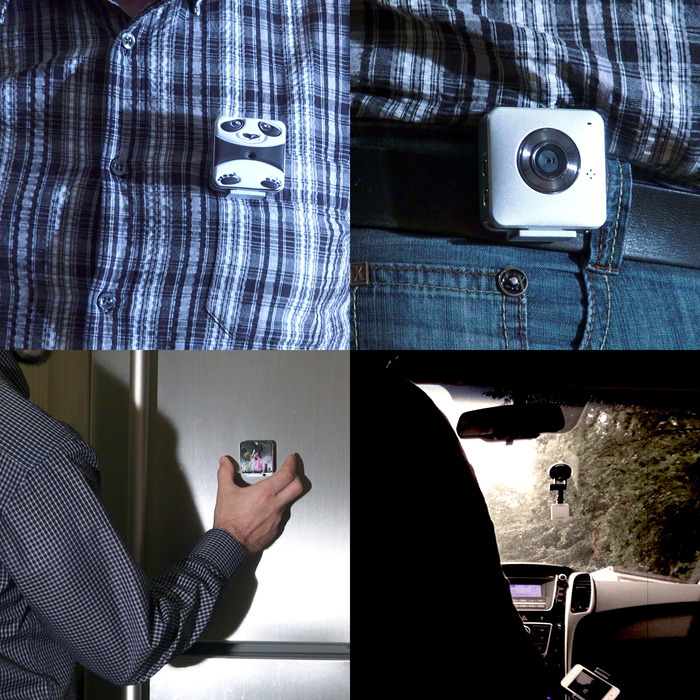 Early backers at all perk levels get a vehicle mount (along with all the clips and mounts). Desire a custom skin for your ParaShoot? Early backers will get their choice of a custom skin as well. We also suspect that other skins will be available after the product launches. The Indiegogo campaign also adds a distributor package, netting 10 devices for $1,350, which provides for a good rate of return if you sell them at the suggested retail price of $269 each. Early individual backers can get their ParaShoot 2.1 starting at $149. For that, you get all the mounts, a custom skin and the color of your choice (arctic white, silver or black). The ParaShoot app will enable your smartphone to work as a view finder and camera manager. The app will be available for iOS, Android and Windows Phone. ParaShoot 2.1 has a 100 degree field of view, has Wi-Fi 802.11b/g/n compatibility, will accept microSD cards up to 64GB, and records in 720p HD video at 30 fps in H.264 format. You can record video on a loop or utilize time-lapse photography. You can also wirelessly share and store your videos via the smartphone app. Check out the video and press release below. Delivery will be made in time for the holidays and if you want to get on board, click on the source link to get your ParaShoot 2.1.